In my continued effort to make use of this my downtime, I have started working on my virtual art hanging project. 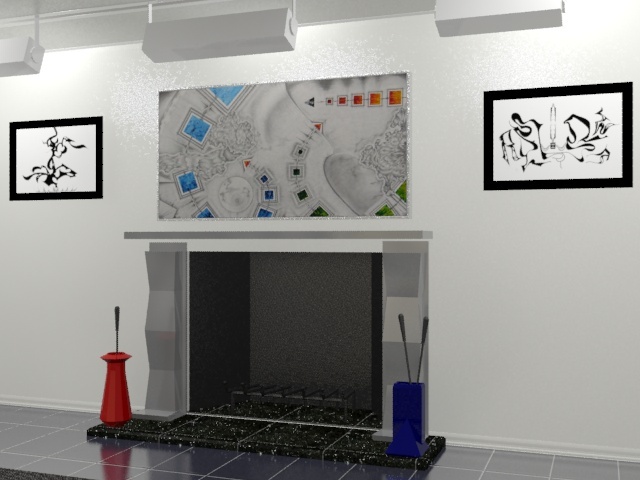 In essence, I am using the skills that I learned in my architectural CAD classes to create virtual rooms in which to hang my artwork. As I delve deeper into my own designs, it becomes apparent to me that I do not have to stick to a “rooms-only” theme. I have been taking copious notes as the ideas come to me. 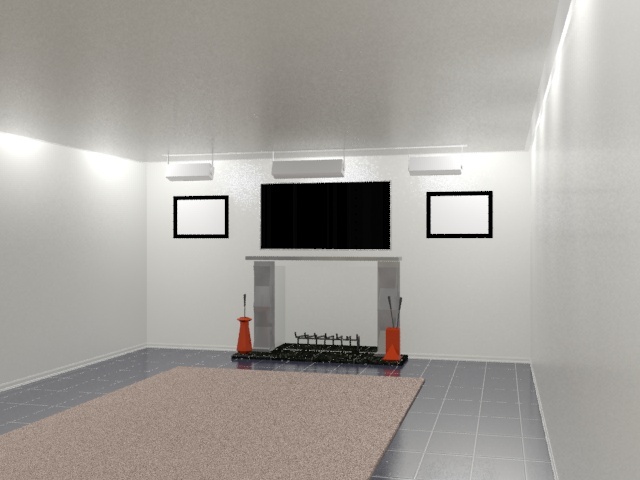 This is a fairly simple rendering compared to the last one I completed for my Architectural Rendering class. I used the same autoCAD drawing as a template. The room has a gallery feel with while painted walls and stealth lighting that is softly projected around the perimeter of the dropped ceiling. I alternated between two different tile colors to see which worked best with the lighting. The large carpet and leather/wood bench are meant to create a warm, residential feel. I created a custom fireplace with custom ceramic poker holders. Three art pieces hang above the fireplace. The largest is my current favorite untitled concrete panel panel. It does not appear in its original form with stainless steel bolts at each corner. Instead, it has been cropped and framed in brushed chrome. To the left and right are enlarged versions of some older ink drawings of mine framed in anodized aluminum. 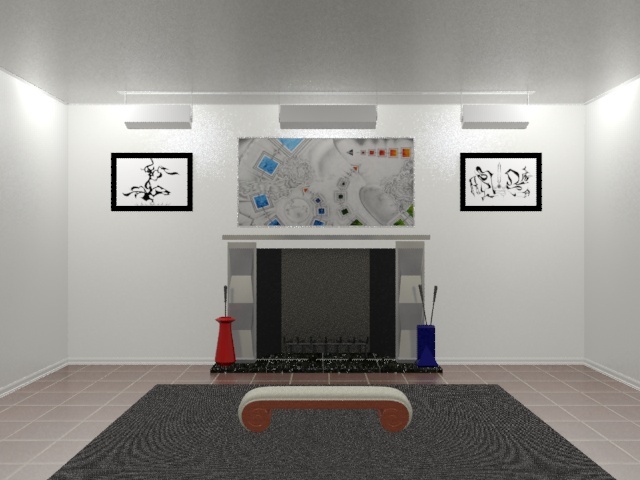 A simplified rendering featuring a custom fireplace. No art or furniture has been added. Wide-angle view of the fireplace art display. Art has been superimposed and a piece of furniture has been added. Close-up angled view of the fireplace art display. I know it’s only my first rusty attempt since graduating, but I feel like I need to make a much more elaborate attempt. As our instructor, Brian Lym of Lym Architecture told us in class, it’s going to take a long time to master the application of materials, mapping and lighting to lend indistinguishable realism to the environment. This architect initially caught my attention simply because he sounded a bit like Arnold Schwarzenegger. As his presentation unfolded, I remained engaged due to his environmentally conscious ideas, innovative designs, and seemingly “accidental” – but amazing project commissions. In order to stay sharp in all the rendering programs that I have learned to use over the last 18 months, like AutoCAD, 3DS Max and Revit, I have decided to initiate a few of my personal design projects. 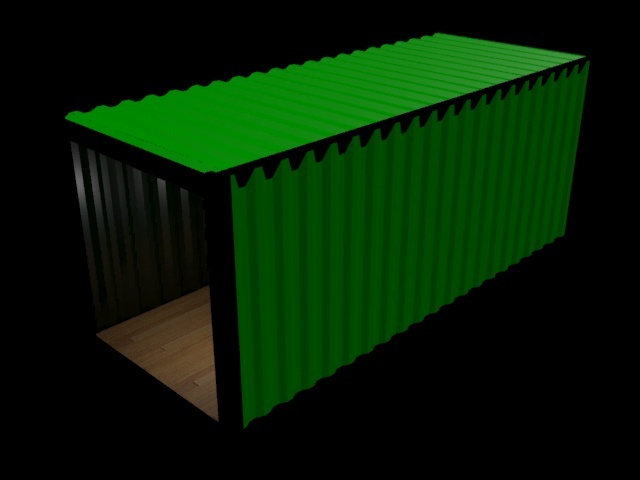 One of the ideas that had been floating around in my head was a design for a personal creative space/art studio that is constructed from one or more ISBU’s(Intermodal Steel Shipping Unit) – better known as shipping containers. 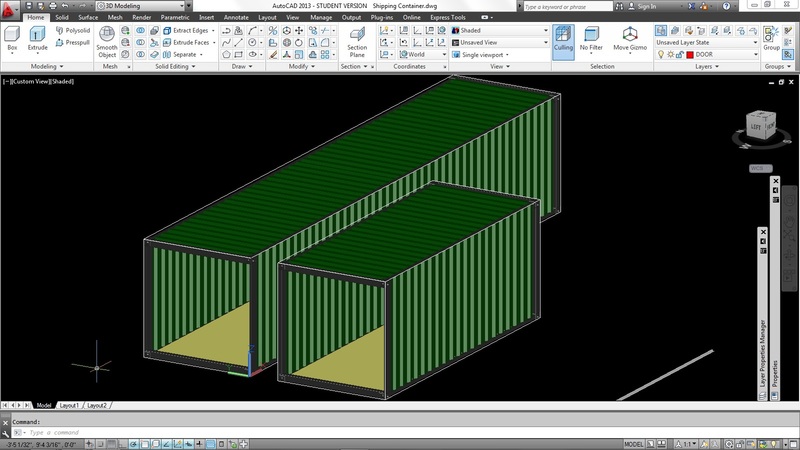 Basic 20ft and 40ft ISBUs I drafted using AutoCAD 2013. My ISBU test rendering using 3DS Max with low light and no background. 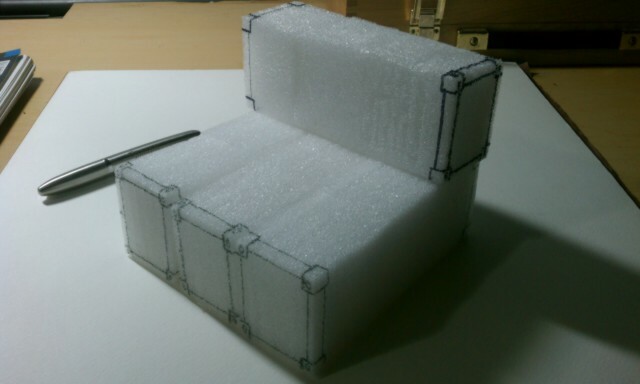 Some styrofoam blocks that I made for quick configuration mock-ups and sketches. There are already a few ISBU projects that have been successfully completed here in Austin. Probably the most recognized was the La Boite coffee shop on south Lamar. I found out later that La Boite was designed by a UT School of Architecture graduate. After a few weeks of research, I found several other local projects in the works. Not to mention the countless other – and much more elaborate projects around the world. I have collected a few of my favorite examples. 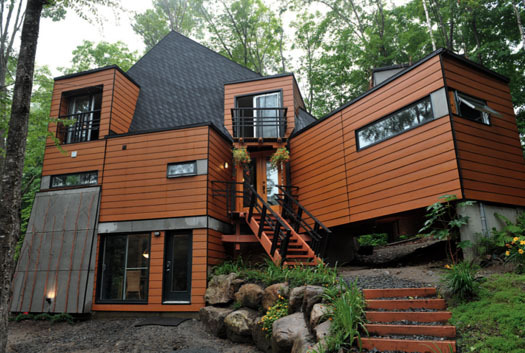 Stunning house built with 7 ISBUs by Maison IDEKIT Home. I plan on starting with this stand-alone, green studio project using 1 – 3 20ft. containers. In order to maximize the natural light, much of the steel paneling will be cut out to make room for large windows on every wall except the main hanging wall which will double as the painting/work wall. The studio will be wired for lighting, heating and air conditioning. Roof-mounted solar panels will provide auxiliary power. I want to integrate as many natural materials into the interior as possible. Bamboo is my favorite wood-like materials. It should do well for the flooring and the furniture. As I learn more about the various building methods, from foundations to insulation and external veneers, I will attempt to design something larger. Something that is a little more architecturally unique. From what I have seen so far, there are no set rules regarding these ISBU-based designs – with the exception of regional building codes. Again, being less of an architect and more of a drafter, codes will remain one of my areas of weakness until I get further in my architectural education. Having an appreciation for both architecture and music, I thoroughly enjoyed this colorfully simple animation.